COLOGNE, Germany, April 3, 2019	(Newswire.com) - 4Stop (“FourStop GmbH”), a leading global provider for KYC, compliance and fraud prevention, today announced that it has been selected as winner of the “Best Financial Transaction Security Platform” award by FinTech Breakthrough, an independent organization that recognizes the top companies, technologies and products in the global FinTech market today. The FinTech Breakthrough Awards is the premier awards program founded to recognize the FinTech innovators, leaders and visionaries from around the world in a range of categories, including Banking, Personal Finance, Lending, Payments, Investments, RegTech, InsurTech and many more. 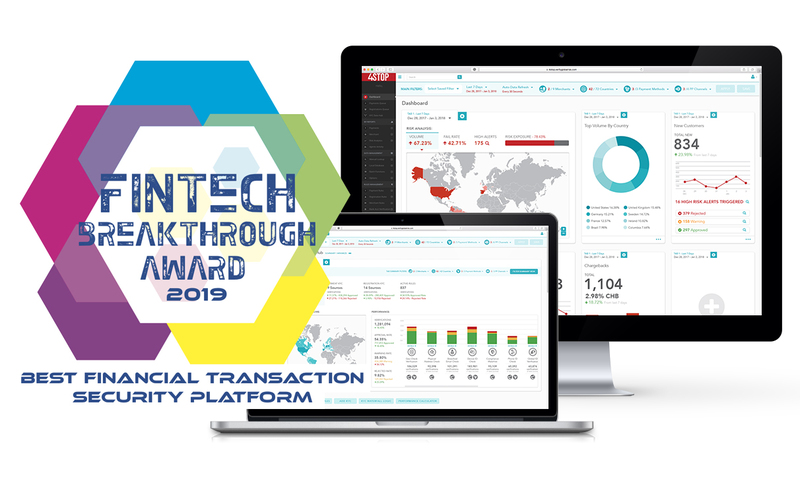 The 2019 FinTech Breakthrough Award program attracted more than 3,500 nominations from across the globe. 4Stop’s all-in-one risk management platform brings together their proprietary real-time anti-fraud technology paired with thousands of aggregated global data points and hundreds of global premium KYB and KYC data sources to effortlessly obtain global compliance and optimise fraud defence, all from a single integration. Businesses can apply KYC verifications, risk thresholds and anti-fraud parameters per merchant, sub-merchant, region, type, market/industry, date/time, etc. Businesses have full control of their transactional management in a fully automated manner. Through the single-view-of-risk, overall monitoring is efficient with minimal requirement for manual intervention. 4Stop continues to expand its platform to support businesses' online engagement, from on-going aggregation of data, expanding KYC data sources and furthering the proprietary technology and features available, including implementing machine learning. 4Stop has been designed to be the simple, fail-safe, future-proof solution. “We have integrated more than 400 data sources already and we’re averaging two to three new data sources with every release we make. We constantly have our ears and eyes open in the industry, finding fantastic providers that work with us, which enables us to offer very strong value to our clients,” states Ingo Ernst, CEO, 4Stop. With collectively over 60 years’ experience in the risk management industry, the team at 4Stop have a thorough understanding of global risk mitigation needs within various markets online. “Risk management is our passion and we designed our product to not only exceed worldwide KYC, compliance and fraud prevention needs but to deliver on these requirements from a single API, all-in-one solution with real-time results, empowering businesses and accelerating their performance,” states Ingo Ernst, CEO, 4Stop. Part of Tech Breakthrough, a leading market intelligence and recognition platform for technology innovation and leadership, the FinTech Breakthrough Awards program is devoted to honouring excellence in Financial Technologies and Services companies and products. The FinTech Breakthrough Awards provide public recognition for the achievements of FinTech companies and products in categories including Payments, Personal Finance, Wealth Management, Fraud Protection, Banking, Lending, RegTech, InsurTech and more. For more information, visit FinTechBreakthrough.com. For more information, please contact an account representative at sales@4stop.com. For marketing inquiries, please contact marketing@4stop.com. Global KYC, Compliance and Anti-Fraud Technology Provider 4Stop Launches Phase Three Product Enhancement for World-Class KYC Implementation and Management.